If the system determines a collision is possible, it gives both visual and audible alerts. uTake appropriate action to prevent a collision (apply the brakes, change lanes, etc.). The system may give warnings of potential collisions when your vehicle speed is above 10 mph (15 km/h). FCW cannot detect all objects ahead and may not detect a given object; accuracy of the system will vary based on weather, speed and other factors. FCW does not include a braking function. It is always your responsibility to safely operate the vehicle and avoid collisions. You can change the Forward Collision Warning Distance setting or turn the system on and off. 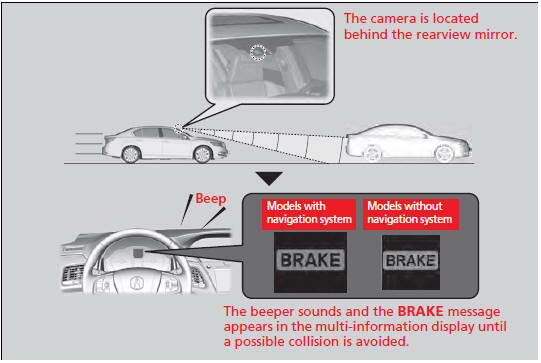 For the FCW system to work properly: The camera is shared with Lane Departure Warning (LDW). FCW may automatically shut itself off and the FCW indicator comes and stays on when: • The temperature inside the system is high. • The windshield is blocked by dirt, mud, leaves, wet snow, etc. Once the conditions that caused FCW to shut off improve or are addressed (e.g., cleaning), the system comes back on. Never apply a film or attach any objects to the windshield that could obstruct the FCW camera’s field of vision. Scratches, nicks, and other damage to the windshield within the FCW camera’s field of vision can cause the system to operate abnormally. If this occurs, we recommend that you replace the windshield with a genuine Acura replacement windshield. Making even minor repairs within the camera’s field of vision or installing an aftermarket replacement windshield may also cause the system to operate abnormally. After replacing the windshield, have a dealer recalibrate the camera. Proper calibration of the FCW camera is necessary for the system to operate properly. If the Can Not Operate: Camera Too Hot/CAN NOT OPERATE message appears: • Use the climate control system to cool down the interior and, if necessary, the defroster mode when windows are fogged. • Start driving the vehicle to lower the windshield temperature, which cools down the area around the FCW camera. FCW may not activate or may not detect a vehicle in front of your vehicle, and may activate even when you are aware of a vehicle ahead of you, or when there is no vehicle ahead, under the following conditions. ● The distance between your vehicle and the vehicle ahead of you is too short. ● A vehicle cuts in front of you at a slow speed, and it brakes suddenly. ● A vehicle suddenly crosses in front of you. ● When either your vehicle or the vehicle ahead of you accelerates rapidly. ● The vehicle ahead of you is a motorcycle, a small vehicle, or a unique vehicle such as a tractor. ● When you drive off-road or on a mountain road, or curved and winding road for an extended period that makes it difficult for the sensor/camera to properly detect a vehicle in front of you. ● When there are pedestrians or animals in front of your vehicle. ● When you drive in bad weather (rain, fog, etc.). ● A heavy load in the rear or modifications to the suspension tilts your vehicle. ● An abnormal tire condition is detected (wrong tire size, flat tire, etc.). ● When the windshield is blocked by dirt, mud, leaves, wet snow, etc. ● When the temperature inside the system is high. ● A sudden change between light and dark such as an entrance or exit of a tunnel. ● You drive into the sunlight (e.g. at dawn or dusk). ● When the windshield is dirty or cloudy. ● When streetlights are perceived as the taillight of a vehicle in front of yours. ● When driving at night, the vehicle ahead of you is running with either taillight bulb burned out. ● When you drive in the shadows of trees, buildings, etc.